Das Obstmesser wird für verschiedene Obstsorten oder auch für Kuchen und Toast verwendet. Ganz hoch im Trend liegt auch, das Obstmesser als Couvertmesser zu benutzen. Das Obstmesser ist ein kleines, leichtes Messer, mit dem man auch härteres Obst jederzeit bequem am Tisch aufschneiden kann. Bereits seit 80 Jahren produziert das Unternehmen Kochgeschirre und Bestecke aus Cromargan®. Der Name Cromargan® setzt sich aus den Begriffen „Crom“ und „Argan“ zusammen. Die Vorteile dieses Materials: Cromargan® ist säurefest, nicht rostend, geschmacksneutral, pflegeleicht, spülmaschinenfest und von nahezu unbegrenzter Haltbarkeit. You need a variety of knives in the kitchen to chop up different types of food properly. With a WMF knife set, you'll always have the most important kitchen knives for any occasion at your disposal and your kitchen firmly under control! You can find our high-quality knives combined intelligently in our knife sets. Some of the sets, such as the 5-piece Grand Class set for example, cover all your possible needs in the kitchen. Utility knives, bread knives, carving knives, vegetable knives and chef's knives – all you need to chop up any kind of food products into the size you want. The proven quality of our special steel blades, as well as the robust and durable joint between the blade and the handle turn your knives into tools that give you a clean cut and perfect results. Whether you choose a knife set or you prefer to create your own collection of individual knives, you will always benefit from the blades' special "Made in Germany" quality. Our high-quality blades are made at the WMF workshop in Hayingen, in southern Germany. We combine traditional forging techniques with the most cutting-edge technology, producing knives that are built to last. A range of knives in our knife sets – get the right cut! The right choice of blade is key in how easy it is to cut a type of food. Our knife sets combine different knives with various kinds of blade. That way you will always find the right knife – and for smaller quantities you can cut anything to a perfect shape with either a utility knife or a chef's knife. Utility knives have a blade with a so-called straight spine. The curved cutting edge and straight spine mean these knives can roll through each cut. This contrasts with vegetable knives, which have a straight blade. A curved spine combined with a straight blade makes it possible to pull the knife straight through the cut. In our knife collections and different knife sets you will always find the right knife for the job! Knife sets in colour – making cooking fun! We have done with our knives what is already common practice with cookware. Pick out a two-piece knife set in bright colours from our collection and add a touch of colour to your kitchen! You need never skimp on quality with these knives. Our product range includes fruit knives as valuable additions to all WMF collections. Our delicate yet powerful knives are great for cutting not only fruit, but also cakes and tarts into bite-sized pieces. A useful cutlery piece for everyday use or a stylish addition for festive meals. Our fruit knives in stainless Cromargan® steel are perfect for every occasion. Lightweight knives with their tried and tested WMF serrated edge are suitable for cutting both soft and hard fruits as well as cakes, pastries and tarts into perfect portions. We have no idea if the royal tables of yesteryear were as beautifully laid as you can set yours with WMF cutlery collections, but we're sure that our product ranges enable you to conjure up a table fit for a king. And we believe that our fruit knife adds the finishing touch, not least since it can also serve as a dessert knife for fruit, cakes and tarts. Because our fruit knives are available as separate additions to all our collections, they can also be employed as dinner knives. Incidentally, the term "dinner or table setting" is generally used to refer to both crockery and cutlery placed on the table before the diners sit down. This includes at least one plate as well as a complete cutlery set comprising a knife, fork and spoon. Depending on the type and number of courses to be served, various items of special cutlery, like fish cutlery or even fruit/cake cutlery, can be added.  We at WMF want you to be able to choose your favourite cutlery. Our wide selection of cutlery sets and individual pieces offers you plenty of choice. In addition to table cutlery, each collection includes a variety of accessories like serving cutlery, salad servers and of course matching fruit knives. Choose from these and many more accessories to make up your own individual cutlery assortment from our ranges, from the Baroque-inspired perfect hard silver-plated Augsburg thread pattern to the simple designs of our Ambiente collection. Incidentally, older children can use fruit knives as children's cutlery in combination with a cake fork. This way, even your children's place settings are in harmony with your festive table.